Spider veins have a central feeder vessel with radiating fine vessels from a central dot or punctum. This classic spider vein is often the result of trauma. Arborizing vessels are those that are either disconnected or spread like branches of a tree. These dilated vessels are caused by heredity issues, sun-damaged skin, hormonal changes or changes associated with adult acne and rosacea. 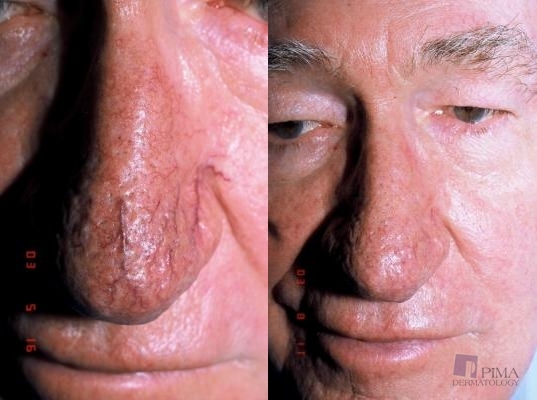 Reticular veins are large, deep blue veins typically on the cheeks or around the eyes. 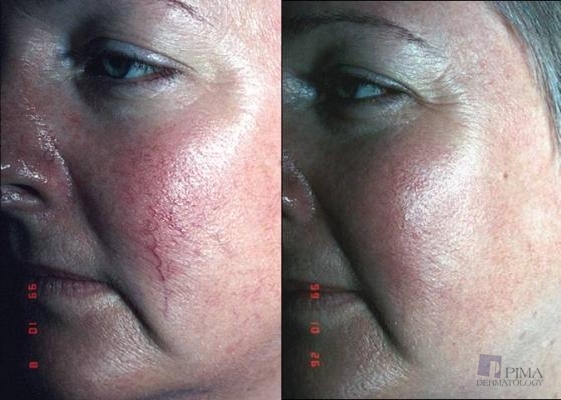 The Vbeam Pulsed Dye Laser is a yellow light Laser and is used for both blush-like facial redness, rosacea, and branching vessels. A combination of the two Lasers is often used when there is more than one type of vessel present. Starlux Intense Pulse Light is a broad band of light in the green and yellow spectrum. How do our Lasers work? The various Lasers available all emit a powerful yellow or green light beam. As it is visible light, the Laser light is not a harmful light source when targeting the unwanted vessels. The Vbeam and the Versapulse Laser are selectively aimed at and absorbed by the targeted red blood cells present in the vessels. The target absorbs the energy and transfers heat to the vessel, which becomes inflamed, slowly collapses and disappears or diminishes over time. There is little risk of harming the overlying skin and/or leaving scar or texture change on the skin. The Vbeam Laser delivers short millisecond pulses of yellow light, which impact the skin and can be done without leaving a purple bruise-like area on the skin. It feels like a skin prick or rubber band snap on impact. The unwanted vessels are treated by a train of small circular pulses (3-10 mm in size) depending on the vessel size. The Versapulse Laser emits a green Laser light, which is of a fixed wavelength, but the duration and energy of each pulse can be varied extensively to precisely target vessels of different sizes and depths. After the treatment, the skin usually appears red and there can be mild to moderate swelling for several days. Larger vessels, such as on the nose, can turn slightly purple but this rarely lasts more than a few days. On occasion, a slight whitish discoloration, bruising, or a small crust can occur over the treated vessel for several days. This procedure enables a quick return to work with very little downtime. Makeup may be used a few days following the procedure. Several treatments are commonly used to obtain the optimal improvement, and the treatments are usually very well tolerated. 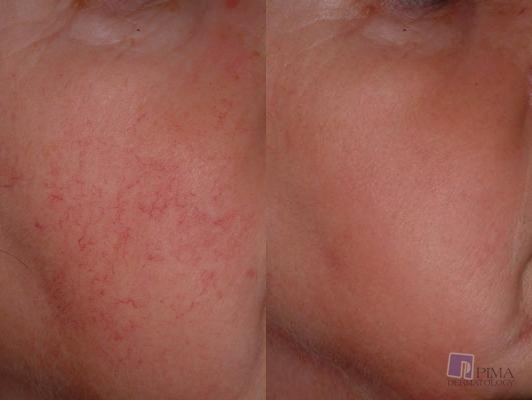 Can injection treatments be done on facial veins as with leg veins? Injection therapy is almost always the treatment of choice for unwanted leg veins. Laser therapy is not the treatment of choice for leg veins because it is expensive, more painful and may lead to long-lasting discoloration at .treatment sites on the lower legs. 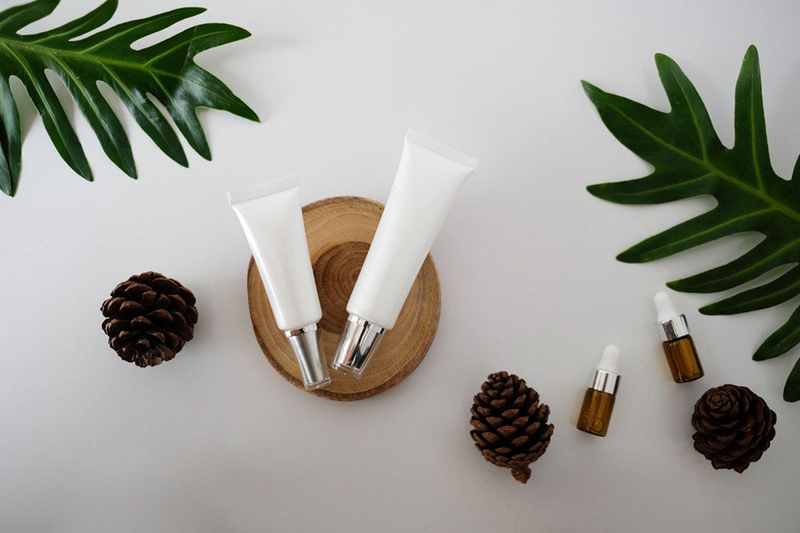 On rare occasion, large caliber vessels on the face can be injected with a solution, which irritates the inner vessel lining and slowly closes off the vessels. Repeated injections are usually necessary and this is done in-office and is quick and very cost-effective. There is a risk of temporary pigmentation change and a rare possibility of scarring. Next, read about fractional laser resurfacing.